How often can you find a book with 400-plus gorgeous photos that’s reasonably priced, not awkwardly sized or ridiculously heavy to pick up? That’s what I got when I bought Humans of New York, which I think is one of the most exciting and best photography books I’ve seen. I’m not a connoisseur, but I do love photography books and have a cherished, though modest collection that I started acquiring in the 1970s with my first one, The Family of Man. Photographer Brandon Stanton captures so much that is right about New York: the posturing, the beautiful women, kids being kids, fragile senior citizens, hipsters, hairstyles, fashions, kooky antics, faces and especially the smiles. 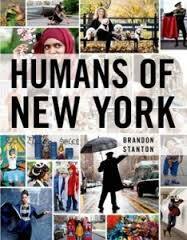 The collection looks like it took a year or more of pounding sidewalks to find worthy material but remarkably, Humans of New York was a 2010 summer project. His book isn’t laden with excess description and verbiage. When Stanton labels a photo, he gets it just right with a few words, or he let’s the subject explain him or herself, such as the pretty girl with an attitude and fabulous hair, who says: “I’m going to let you take my photo because you seem like a genuine person. But just so you know — I don’t normally let people steal my swag.” Most of the color photos evoke a sense of joy, but when Stanton flirts with the seamy side of New York life, you still feel the humanity. I will never again gaze upon a manic grin, or an elderly man wearing a fairy costume or hear some crazy talk, without cutting that person a lot of slack.